As unpredictable as spring weather can be and as wet as this spring has been, five of my biking buddies and I were positive we were going to get wet at some point during this past weekend. Before we took off on our long drive to Maryland, we kept the internet and local bike shops busy as we stocked up on wet-weather riding gear in addition to all the many other things one needs for three days on the trail. 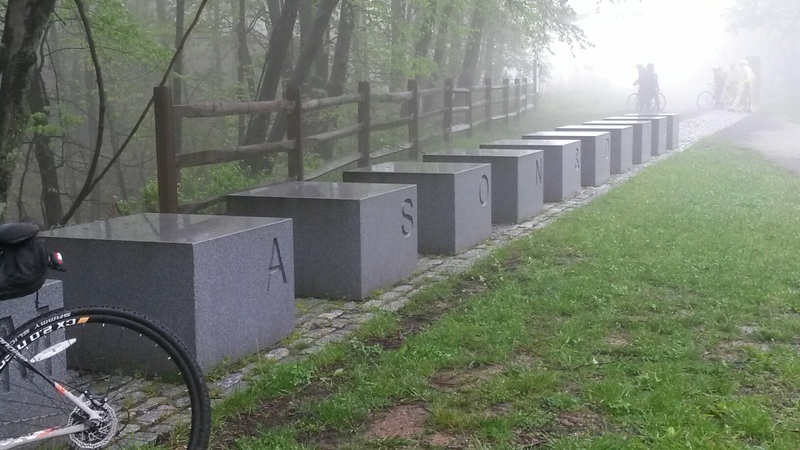 And we did get rather wet and extremely muddy on the first two days of riding on the Great Allegheny Passage (GAP) trail. 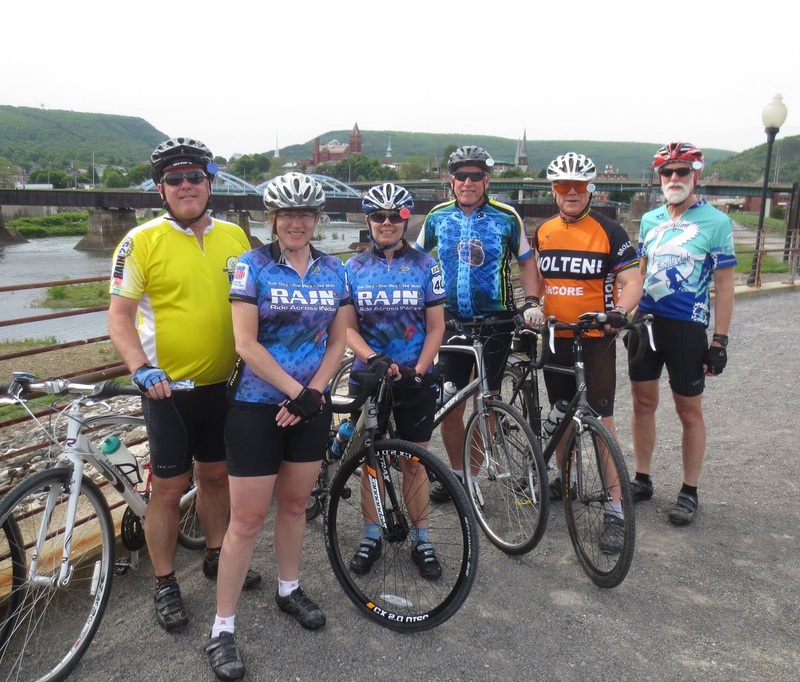 We arrived in Cumberland, Md., in the early evening on Friday and headed right out for a 12-mile warmup on the Chesapeake and Ohio Canal Towpath trail, which joins the GAP trail. The scenery, wooded and green, was beautiful, but the trail was rather muddy. A group meeting after that came to the conclusion that rain or no rain, mud or no mud, we came to ride, and ride we would, even if extensive and constant weather-app searching could find no sun in sight. The next morning, looking like puffy Michelin tire figures or chubby gnomes or at least unfortunate fashion victims in our raingear and neon helmet covers, we started north on the trail to reach the Eastern Continental Divide. Logically, the Divide is the highest point on the GAP trail, so from Cumberland the ride went 25 miles in a continuously up direction. We are used to riding hills, but around Bloomington, once you summit a hill you get a chance to coast down the other side. On this trail, there was only the one summit and no coasting, just more up until we got to the Divide. The GAP trail is built on a former railroad bed, so naturally the slope doesn’t exceed 3 percent. But even 1.5 or 2 percent of grade gets tiring when you can’t stop pedaling at all. I can’t tell you about the scenery on this section of the trail, because with the rain and fog we didn’t see it. The photo at left was taken at the Mason-Dixon Line Park along the trail and gives you an idea of what visibility was like. The two of our group who rode the trail a few years ago told us about the vistas we were missing. What we did see and hear were the freshets and waterfalls coming through the woods and over the rock faces along the trail, and these were pretty. We could see the tunnels as we approached them and found that viewing a tunnel head-on distorts perspective and that they are always much longer than they appear. If not furnished with electric lights, a thousand feet of tunnel also gets very, very dark. We had all brought our bike lights with us, but, not knowing about the tunnels, only two of us were smart enough to put them on our bikes. This resulted in some scary time in dark tunnels and rather disconcerting, surreal riding when you couldn’t see the ground or even the people riding with you. At the Eastern Continental Divide, the temperature read 50 degrees, a far cry from the mid-60s we were expecting. No matter, the trip home was all downhill and despite cold fingers we bombed down the homeward 25 miles, almost doubling our pace compared to the way up. The Sunday ride starting out in Ohiopyle was also uphill then downhill, and although it was still rainy, it was 10 degrees warmer than Saturday, so we plugged along through the muddy gravel a little more happily. 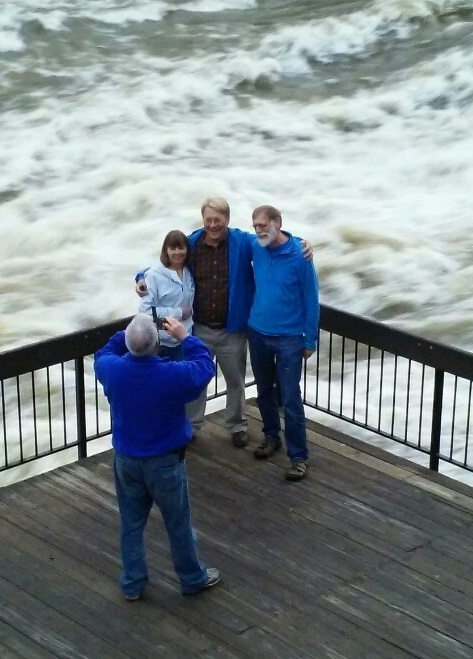 As a reward for enduring all the rain, the Youghiogheny River at Ohiopyle Falls was raging and beautiful with all the extra water it was carrying. 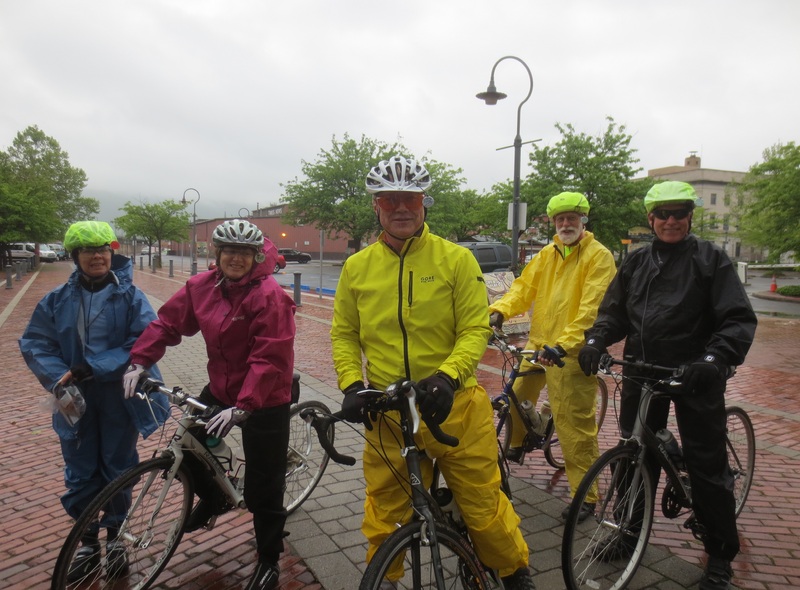 On Monday, four of us started off in raingear from Ohiopyle while the other two of us drove to West Newton so that the cars would be closer to our hotel when we finished the ride. When we two got to West Newton, the sun had come out and the temperature was going up, so as we started riding south toward the other four riders, we actually looked like normal bikers in Spandex and didn’t bring any raingear at all. Hooray! When we met up with the riders coming north, they had all shed their coats, and we finished our days on the GAP trail warm and dry, and ready to do it again someday soon. More photos from our trip can be found on my Facebook page Out of Work Editor. Previous Article Previous Article: Visit Shiloh—Done!